I’m continually amazed at how meaningful seemingly insignificant moments can bring such pure and simple joy — random finds, random acts and examples of kindness and goodness and chance meetings can make such a huge difference on days which seem mundane. 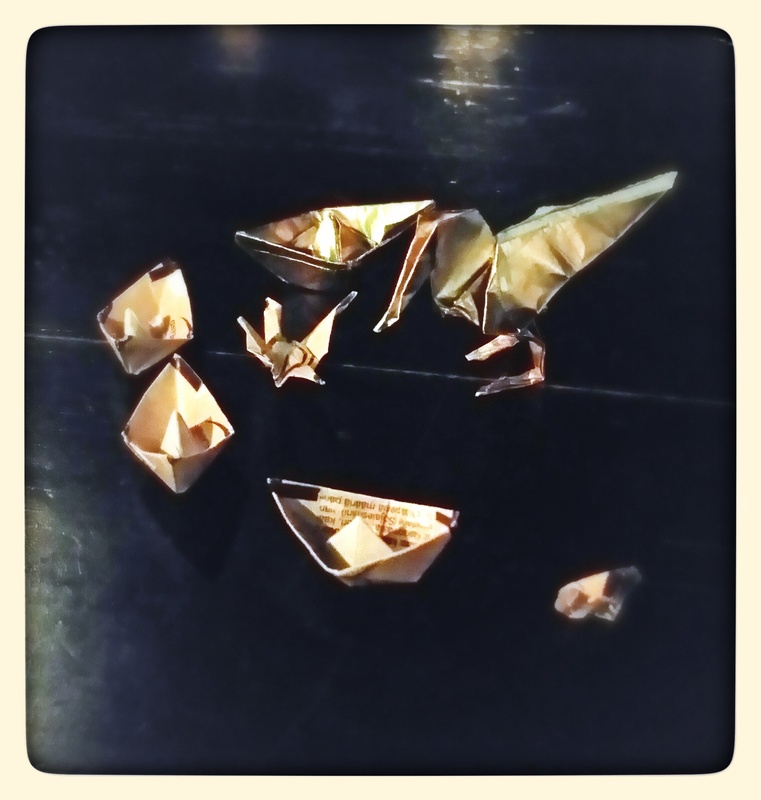 Yesterday, when meeting up with two friends, we sat down at the table to find this tiny little origami scene. A random bit of loveliness on an otherwise dreary day. So many moments on most days are utterly random and governed not by careful planning but by the intricate and delicate mixture of us and the various pieces in any particular scene. Change one ingredient and the result can be vastly different. The Cuban and I took a taxi a few days ago and it was without a doubt the best taxi ride ever. Why? Well, the music didn’t hurt (i.e., blues, more specifically, B. B. King) coupled with an amazing sound system the driver was obviously proud of. But, mostly, it was the taxi driver himself. He was chatty from the moment we opened the door and on the entire route home, hilariously witty and obviously enjoying himself as much as we were entertained and amused. The typical taxi ride in Helsinki consists of a whole lot of silence. This ride was anything but that. What made it even more meaningful was just how random it was that we sat in that particular taxi. Best taxi ride ever. We’ll probably never see that guy again, but all other taxi rides will be measured against that one. Yesterday’s origami find was equally random and no less lovely. As we were searching for a table, we noticed some folks getting ready to leave and waited. Had we not waited or had we arrived either an instant earlier or later, we most probably would have missed the little paper goose, tiny boats and cranes. Many of the people we meet come into our lives in much the same way. Chance meetings may result in a whole lot of nothing; but, occasionally, they result in life-long bonds which withstand distance and circumstance and time. That The Cuban and I met was somewhat random. So many individual pieces in our lives had to have fallen into place in just the right way, sequence and time to have allowed us to be in Moscow at the right time. Shift any of the pieces and who knows? Just as the randomness can cause unimaginable chaos, it can also bring boundless delight. I’ll gladly take the chaos just to experience that unexpected delight as much as possible. Bring on the randomness—at the end of the day, it’s a thing to behold and results in one hell of a ride.